Seth Brogan loves his youngest sister Moira, but he is not pleased when she calls him to let him know about a house swap she has arranged. Moira will be living in house in an Irish village that belongs to the sister of Katie MacMillan, a college roommate, and the sister, who needs a quiet, peaceful place to retreat, will be living in Seth’s home. 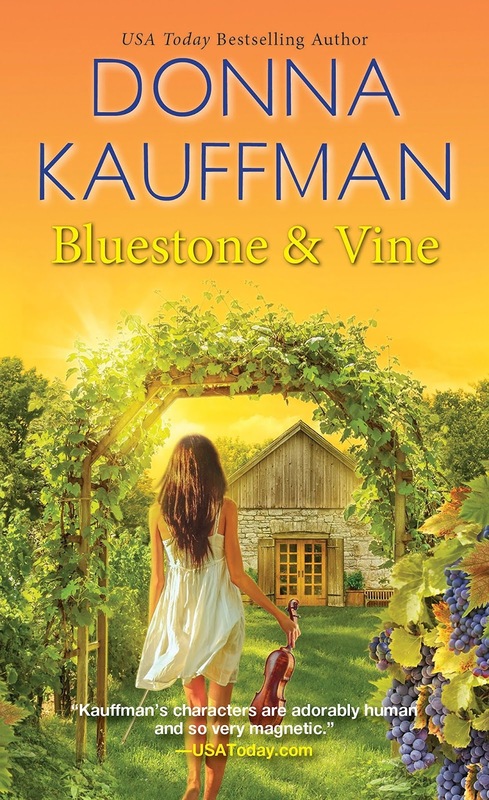 Seth has enough to do caring for Dexter, his music-loving llama, and his vineyard and winery, Bluestone & Vine. He is already making plans to find Katie’s sister another place to live when she lands on his land and in his life, courtesy of a borrowed snowmobile. Pippa MacMillan is a renowned fiddle-playing folk singer, a super star in the United Kingdom, although lesser known in the United States. Her vocal cords ruptured during a performance, and recovery from the surgery to repair them is taking longer than anyone expected. The media buzzards are circling, speculating that Pippa’s career is over. Pippa longs to escape from their scrutiny. The fact that she has not sung since her surgery is a closely guarded secret. Even more disturbing to Pippa is that the inner music she has heard all her life has also gone silent. Tiny Blue Hollow Falls, Virginia, seems an ideal place to get away from her troubles. Despite Seth’s reservations about his uninvited guest, he and Pippa connect almost immediately. They are kindred spirits who share an explosive chemistry as well. The only problem is that Pippa will be returning to Ireland in two months and Seth’s life is his land in Blue Hollow Falls. The community opens its heart to Pippa whom they recognize as one of their own. From octogenarian farmer Mabry Jenkins to thirteen-year-old Jake McCall, his ten-year-old best friend Bailey Sutton, and Dexter the llama, the citizens of Blue Hollow Falls adopt Pippa. Only Seth, the man who helps her recover her music and who wins her heart completely, focuses on an obstacle rather than searching for a compromise and stubbornly refuses to admit his feelings. This is a series that just keeps getting better. Blue Hollow Falls is an interesting, artsy community that has the feel of home to many who relocate there. This third story in the series (following Blue Hollow Falls and The Inn at Blue Hollow Falls, a novella) is a quiet story that captures the reader with its sweetness and its likable, sympathetic characters. Pippa is a delight with her gifts and her openness, and Seth is a great-hearted beta hero who cares for his family, his friends, and every animal or person who needs his attention. The supporting characters are just as appealing. Readers who loved the first novel will be pleased to see more of the lovable Addison Pearl Whitaker and her youngest adoptee, the old-soul Bailey. Sawyer, Seth’s best friend, and his love, Sunny are also a part of the tale, and readers fascinated by the reclusive Wilson McCall in the first book will learn more of his story and that of his son Jacob. Mabry, the old farmer with his wisdom and his romantic streak, is a heart-stealer and a scene-stealer. Kauffman makes this place and these people so warm and real that I was ready to return to Blue Hollow Falls as soon as I turned the final page. I can’t wait for Lavender Blue, Wilson’s story, which will be released January 29, 2019. 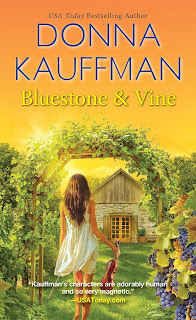 If you are a fan of small-town romance with characters who will win your heart and a setting you wish were real, I suggest you rush to add Bluestone & Vine to your TBR list. You make this sound like a wonderful story. Thanks. I like Donna Kauffman and your review makes this sound great. Thanks, I'll check it out. I love reading her books. I haven't started this series yet. I will read it. I haven't read her books in a long time. Sounds like I'm missing something something. Great review. Gonna start this series. I love this series and your review describes well how I felt while and after reading this book. Thank you!! Awesome review, Janga, as always. I read Book 2 in this series last winter on your recommendation and loved it. About a month or so ago Book 1 was on sale at Amazon and I snatched it up. Now I'm looking forward to Book 3. Thank you. A nice variation on the theme. Thank you for the review. It should be a delightful read. Sounds like a great read. Thanks for the recommendation.